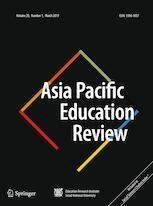 The Asia Pacific Education Review (APER) covers all areas of educational research, with a focus on cross-cultural, comparative and other studies with a broad Asia-Pacific context. It aims to stimulate research, encourage academic exchange, and enhance the professional development of scholars and other researchers who are interested in educational and cultural issues in the Asia Pacific region. APER is a peer reviewed journal produced by the Education Research Institute at Seoul National University. It was founded by the Institute of Asia Pacific Education Development, Seoul National University in 2000, which is owned and operated by Education Research Institute at Seoul National University since 2003. Word Limit for Regular Article: 8,000 – 10,000 words excluding references.